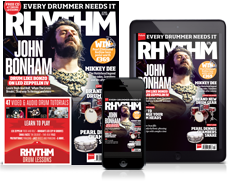 NAMM 2019: Playing acoustic drums at home is not a viable option for most drummers, particularly if you have neighbours who don’t see the merits of 2am paradiddle practice. Thankfully, Evans has a quiet practice solution in the shape of their new SoundOff drumheads. In the past, Evans SoundOff products have consisted of rubber mutes laid over your existing drumheads and cymbals. 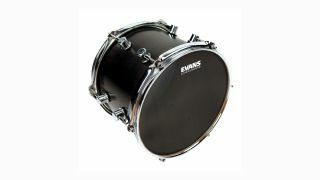 SoundOff drumheads feature a single-ply of black mesh material and fit between the shell and hoop like a standard head. The mesh dramatically reduces the volume of everyday drumming and, because the heads can be tensioned, drummers can dial in their desired feel too. Volume-reducing drum gear has become a big trend in recent years, and the SoundOff drumheads would make a perfect pairing alongside Zildjian’s L80 or Sabian Quiet Tone cymbals. Add triggers and a module/interface into the mix and the SoundOff heads can also act as silent drumheads for an electronic drum setup. SoundOff heads are available for toms, snare and bass drum in sizes ranging from 8" to 24".